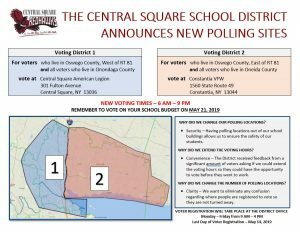 Central Square School District Vote Set May 21, 6 a.m. – 9 p.m.
CENTRAL SQUARE – The Central Square Central School District will conduct its annual budget vote and Board of Education election on May 21, and the District will now have two polling locations, which are the Central Square American Legion and the Constantia VFW. District residents will vote this year on an annual operating budget, safety and security capital project, transportation proposition, and three board of education seats. Nominating petitions for Board of Education candidates and absentee ballot applications are now available online through the Central Square Central School District website, www.cssd.org. Forms can also be picked up from the District Clerk, at the District Office, located in Paul V. Moore High School, 44 School Drive, Central Square. Nominating petitions for candidates for the office of member of the Board of Education must be filed with the District Clerk between the hours of 9 a.m. and 4 p.m. on or before the last day they are due, which is April 22, the office will be open until 5 p.m.
Each petition must be addressed to the District Clerk, Pearl Horn, and include the length of term of the office, the name and address of the candidate, and be signed by at least 25 qualified voters of the District, including the address of each District resident. The district offers a brochure to prospective candidates, providing information on the rights and responsibilities of a member of the board of education, also available on the District website. The district will conduct voter registration at the District Office, Monday through Friday between the hours of 9 a.m. and 4 p.m. Voters may register with the District Clerk up to five (5) days prior to the annual election or with Oswego County Board of Elections up to ten days prior to the election. Personal identification and proof of residency must be provided at the time of registration. Eligible Central Square Central School District residents who are registered voters can cast their votes by absentee ballot. An application may be obtained by contacting the District Clerk or by visiting the district website, www.cssd.org.